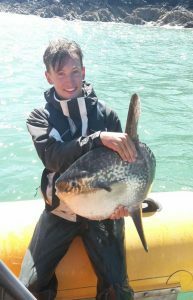 Sunfish are by no means common visitors to Ramsey but we do see them quite regularly in the summer months. They eat jellyfish so our waters provide them with good feeding opportunities if they’re healthy enough to make the most of them. We do sometimes see rather sad listless sunfish covered in sea lice (which you can remove for them) but this one was good and healthy. At over 4 metres fin to fin the biggest sunfish are broader than our boat and can weigh over 2 tonnes – they’re the heaviest bony fish in the world – so this one is quite small but exciting nonetheless.